I’m trying to update my iCal calendar. I want to transfer the info on my iPhone to my Mac only. I’m worried that if I try syncing in iTunes the events on my iPhone will be overwritten by iCal. Any help would be appreciated! Thanks! The problem is, when we try to sync iPhone calendar with Mac computer, we are not able to view the contents on our Mac. The calendar events are very important ones, and they can be very useful for work or daily life which we don’t want to take the risk to lose them, however, the events keep getting lost when iPhone is synced with iTunes, and can’t be found anywhere. As one kind of most important data in iOS devices, calendar events are saved in the iTunes backup, if you have created one, and the backup can be updated to gain more iPhone data. When the data is lost in iPhone, you can restore your phone with the backup to get the lost data back. Restoring iPhone with iTunes is always the easiest way to get your lost data back to iPhone. When the calendar events are gone, you can recover deleted calendar from iPhone by restoring the backup. As iTunes doesn’t provide the sync for calendars anymore, you need to use iCloud to sync iPhone calendar with Mac computer. If users have enabled iCloud on their iPhone, they are able to upload the data to the cloud. When the iPhone calendar events are save in the iCloud backup, you can view them on your Mac computer with ease. The iCloud backup is easy to be done. When your iPhone is connected Wi-Fi and charger, and the screen is locked, then the files in your iPhone will be uploaded to the cloud. You can log into iCloud on your Mac computer and view the calendar events. The method is easy to use, but note that the events in your calendar are not saved permanently in iCloud, and users should download the calendar events from iCloud to their Mac iCal App. Apart from iCloud, is there any way that can help users transfer calendar from iPhone to Mac with no any data loss? The answer is YES. The following guidance will show you how to do that. Besides using iCloud, users can take advantage of the third-party iPhone data recovery software. 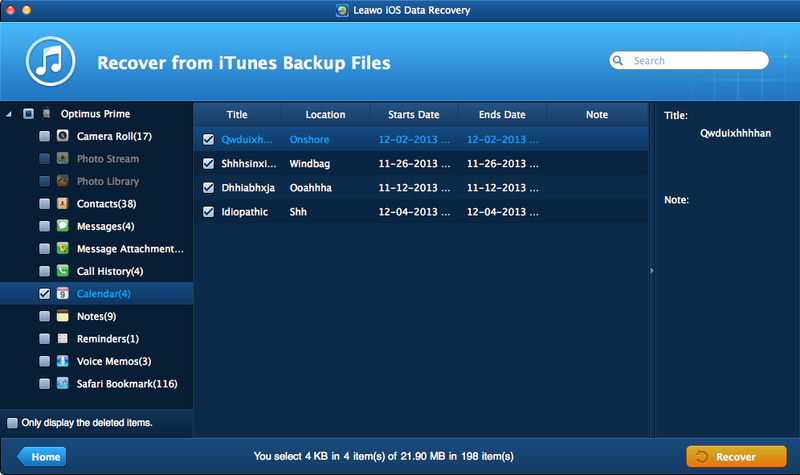 I would like to introduce Leawo iOS Data Recovery for Mac to you. This software enables users to recover deleted files from iOS devices, and it also helps to backup iPhone, iPad and iPod touch data to Mac computer. The following guidance will show you how to transfer calendar from iPhone to Mac computer, and you are allowed to free download the software to have a try. Note that the trial version will stop at the preview window. 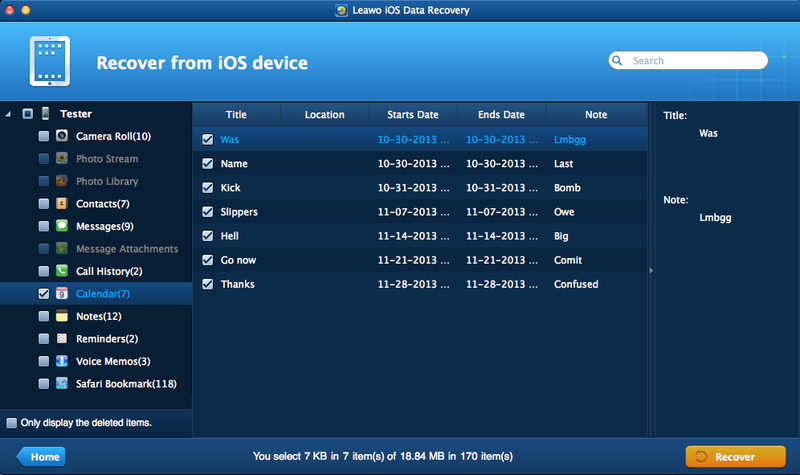 Run Leawo iOS Data Recovery on your computer, and you will see two recovery modes in the main interface. 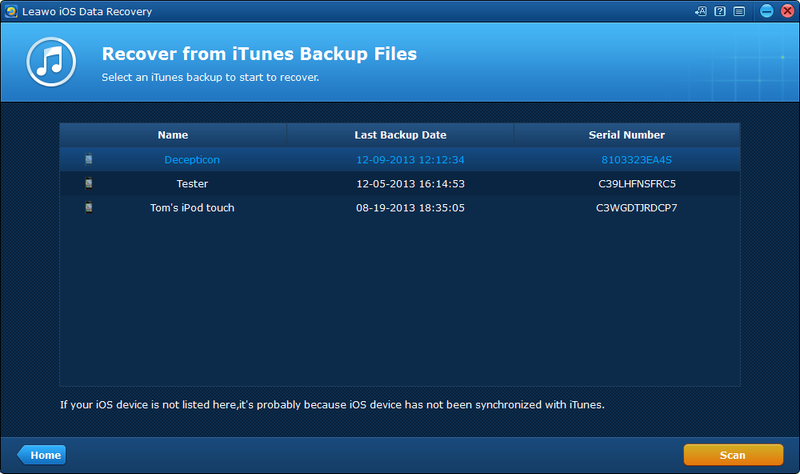 One is “Recover from iOS Device”, the other is “Recover from iTunes Backup”. Choose the former recovery mode and connect iPhone to computer with the USB cable. The software will recognize and analyze your iPhone. After the analysis of iPhone, Leawo iOS Data Recovery will start to scan the contents in your iPhone. Choose “Calendars” in the left sidebar when the scan is done. Check the events you want to back up in the right part, and click the “Recover” button at the right bottom. After clicking the recover button, you will see a pop-up dialog. Click “Open” in the dialog to choose a folder on your computer to save the exported calendar events. Then click “Go” at the right bottom to start transferring calendar from iPhone to Mac computer. You can also use Leawo iOS Data Recovery to extract calendars from iPhone backup in case that you don’t want to connect iPhone to Mac computer. The following guidance will show you how to do it. 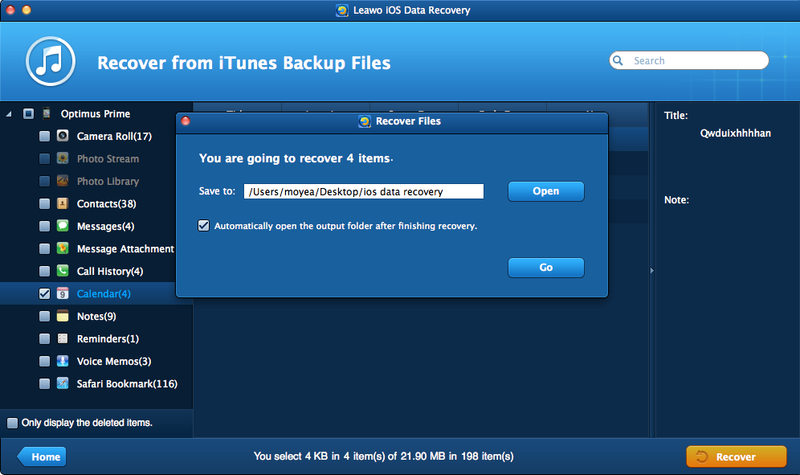 Run Leawo iOS Data Recovery and choose “Recover from iTunes Backup”. The software will display all the backups you have made in the window. Select the iPhone backup and click “Scan” at the right bottom. The software will scan the contents in your iPhone backup. When the scan is finished, choose “Calendars” in the left sidebar, and check the calendar events you need in the right part. Then click the “Recover” button at the right bottom. The dialog will pop up after you clicked the recover button. Click “Open” in the dialog to choose a folder on your computer to save the files. Then click “Go” to start extracting calendars from iPhone backup to Mac computer. Both ways provided by Leawo iOS Data Recovery for Mac are helpful for transferring calendar from iPhone to Mac computer. As mentioned, Leawo iOS Data Recovery also helps recover deleted files from iOS devices. For example, you can recover deleted iMessages from iPad with this software. So check it out if you are interested.